Icebreaker 2 Release Date Announced! Wow, the time sure does fly. I can't believe it's been almost two years since I first reported that the 3DO encryption method had been broken, and that a company called OlderGames was interested in publishing the unreleased sequel to my videogame, Icebreaker. But it's all true, and amazingly enough, everything's on track for the upcoming release of Icebreaker 2! They've even started taking pre-orders! The game itself will look & function exactly as it did when I last worked on it, back in 1996. (Talk about time flying!!!) Although there are many little things about it which I'd like to adjust, no updates to the software were possible... even if I had time to work on it, I don't have access to the antiquated hardware environment necessary to make updates to my old software. All I could offer to OlderGames for their new independent encryption was the final work-in-progress disc I burned for myself before Magnet Interactive Studios imploded. But it worked! They successfully took my carefully-preserved disc image, and created the first new game disc in over a decade that can be run on a standard 3DO multiplayer. And now they're going to publish it, so that anyone with an old 3DO box can finally play it! Woo-hoo! Although I haven't actually created anything new inside the game since 1996, the art you see here (which will be featured on the packaging) is totally fresh. It was newly created for this release by none other than Dave Bondi, the animator who originally brought those pesky little pyramids to life. The metal pyramid is just one of the many cool features you'll find in Icebreaker 2. For details on the others, check out the memo I wrote about it in 1996, or watch the YouTube video I made about it this week. Also be sure to check out my newly updated Icebreaker home pages, which include a list of all the levels in the new game and the names of the people who designed them! 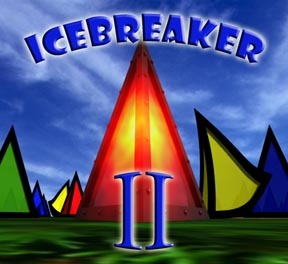 Most of all, if you want to be able to play my totally new ancient videogame, and you don't already own a 3DO, it's time to start looking for one on eBay, because Icebreaker 2 comes out on July 28th!!! A "sleep helmet" has been invented, which somehow puts you to sleep instantly, and so fully that you get all the benefits of full-night's sleep in just 3 hours. Finally! That's the kind of Life-in-the-Future invention I've been waiting for almost as long as my personal Jet-Pack! As someone who already experiments quite a bit with how I sleep, I can't wait to try Giulio Tononi's Sleep Helmet! "Of course, when the Founders wrote the constitution, they provided for a war czar, whom the called 'the president' and designated as the commander-in-chief. Apparently, by trying to create a new czar, the White House is finally admitting that George W just isn't up to the job of coordinating his own appointees, including the secretaries of defense, state, and so on. However, the performance of our self-proclaimed 'war president' has been so disastrous that the Bushites are having a hard time finding anyone willing to take the czar job. Three retired four-star generals have already turned down the offer. As one of them, retired Marine General Jack Sheehan, said 'The very fundamental issue is, they don't know where they hell they're going.'" -- Jim Hightower, from the "Wanted: War Czar" sidebar to the cover story of the May 2007 issue of the Hightower Lowdown: "Yet The War Goes On"